Mount Holly v. Mount Holly Gardens Citizens in Action, a housing discrimination case that was scheduled for oral argument before the U.S. Supreme Court on December 4th, was settled last night according to the New York Times. The settlement was approved by the Mount Holly Township Council and results in an increase in the number of homes that will be built and requires a set aside of a certain number of homes for current residents. Due to the settlement, the case will be dismissed, leaving open the question whether claims under the Fair Housing Act require proof of intentional discrimination. The lower court (3rd Circuit Court of Appeals) had allowed the case to go to trial under the "disparate-impact" theory. From Strategically Social: In an unpublished opinion, the 11th Circuit Court of Appeals recently addressed a police officer's lawsuit against the City of Atlanta alleging that the chief failed to promote the officer in retaliation for a comment she posted on Facebook criticizing another officer. Gresham v. City of Atlanta (11th Cir., October 17, 2013). The officer had posted a comment on her personal Facebook page criticizing a fellow officer for interfering in an unethical manner with plaintiff's investigation of a suspect for alleged fraud and financial identity theft. Although the officer's Facebook page's privacy settings allowed only "friends" to view posts, her comments found their way to the City's police department's office of professional standards. Plaintiff was investigated for an alleged violation of the department's work rule requiring that any criticism of a fellow officer be directed through official department channels, and not be used to the "disadvantage of the reputation or operation of the Department or any employees." Plaintiff argued that the reason she was not promoted when eligible was in retaliation for her comments, which were being investigated at the time of departmental promotions. The City argued that she was not promoted because department policy prohibited any promotions during pending disciplinary investigations. The district court ruled in favor of the City, and dismissed the officer's Section 1983, First Amendment lawsuit. The 11th Circuit agreed, applying the four-part Pickering test for employee speech requiring the court to determine whether (1) plaintiff's speech involved a matter of public concern; (2) plaintiff's interest in speaking outweighed the government's legitimate interest in efficient government service; (3) the speech played a substantial part in the government's challenged employment decision. If plaintiff establishes the first 3 prongs, then she will prevail unless defendants can prove that (4) they would have made the same employment decision even in the absence of protected speech. Here, the court determined that the government's interest in avoiding disruption outweighed plaintiff's interest in speaking on this matter. Furthermore, plaintiff violated a clear departmental rule in commenting on a fellow officer outside of official department channels. Finally, the court determined that plaintiff's speech interest was not a strong one, and merely reflected "venting her frustration with her superiors." Thus, the appellate court agreed with the district court's decision to dismiss plaintiff's claims against the City. Title I of the Americans with Disability Act prohibits employment discrimination on the basis of disability. Title II of the ADA provides that state and local governments may not exclude eligible disabled persons from "participation in" or the "benefits of" governmental "services, programs, or activities" or otherwise discriminate against an eligible disabled person. The Seventh Circuit Court of Appeals recently considered the question of whether Title II should apply to employment discrimination cases. A Chicago police officer filed a lawsuit claiming that the City discriminated against her in terminating her employment in violation of Title II of the ADA. Two other circuits (9th and 10th circuits) have held that it does not apply but one circuit (11th) has held that Title II does extend to employment discrimination claims. In Brumfield v. Chicago (Nov. 6, 2013), the Seventh Circuit answered the question whether Title II of the ADA should be a supplemental remedy to Title I to cover employment discrimination, joining the 9th and 10th circuits to hold that Title II does not cover disability discrimination in public employment. The Seventh Circuit stated that the language of Title II made it clear that it did not apply to employment decisions of state and local governments, finding that "employment" was not covered by the "service, program, or activity of a public entity" provision of Title II, nor did an employee fall within the category of "qualified individuals" who could invoke the protection of Title II. On July 30, 2013, Lake County and County Board Chairman Aaron Lawlor filed a lawsuit against the Chief Judge, Illinois State Board of Elections, and others challenging the new law as unconstitutional and seeking declaratory and injunctive relief. The County alleged that the statute was impermissible special legislation because Lake County is the only county that now, or in the future, would trigger the election commission requirement (the statute applied to any "county with a population of more than 700,000 persons as of the 2010 federal decennial census that borders another state and borders no more than 2 other Illinois counties"). The county also argued that the mandatory imposition of an election commission deprives the voters and the county board of the ability to determine themselves whether a commission is desirable. The defendants defended the law by arguing that the classification was not special legislation but merely a population-based classification. Kane County Circuit Court Judge Akemann, appointed to avoid any potential conflict of interest in having a Lake County Court rule on this issue, issued the opinion in this case. His 18 page written ruling contains a detailed review of case law analyzing the constitutional prohibition on special legislation, and the legality of population-based classifications. In this case, the court determined that although population classifications are not per se illegal, they must meet a two-prong test established by the Illinois Supreme Court. Here, the law failed both prongs of the two-part test. First, the court could not perceive of any rational difference of situation or condition that would support having the law apply only to counties with a population greater than 700,000. Second, the court could find no rational basis to treat an interior county differently from a county that borders another state. “There is simply nothing unique to Lake County’s population or geography that necessitates its singling out through a special law when a general law could be applicable." As a result, Judge Akemann held that the new law violated the special legislation clause by treating Lake County differently than any other county, and enjoined the Chief Judge and Illinois State Board of Elections from implementing, enforcing, or administering the law. HB 924, the bill that would insert a "responsible bidder" provision into the Illinois Prevailing Wage Act, was approved by a 10-5 vote of the Senate Labor and Commerce Committee yesterday. The bill had passed the House in April. If enacted into law, all businesses seeking to bid on public works projects would be required to have an affiliation with a United States Department of Labor apprenticeship program in order to be eligible to work on a project. This bill would affect local governments by resulting in fewer eligible bidders, less competition, and higher costs for public works projects. The Illinois Municipal League has gone on record as opposing the legislation. In addition, the Black Chamber of Commerce testified at the Senate committee hearing in opposition to the bill based on the organization's contention that the bill treats minorities unfairly. The use-or-lose rule, long a sticking point for employees contemplating participation in flexible spending accounts (also known as FSA's or Section 125 accounts), has become a little more flexible going forward. Now employers offering FSA's can modify their plans to allow for a carryover of up to $500 into the following year, or maintain the grace period which allows employees until March 15th of the following year to use FSA dollars from the previous year. Employees can still contribute a maximum of $2,500 in a year even though they have carried over money from the previous year. FSA's or Section 125 accounts allow employees to divert wages, on a pre-tax basis, to pay for qualified medical expenses and child care. Until 2005, the IRS rule required that all of the wages diverted to the FSA in a plan year had to be spent by December 31st of that year (or the end of the FSA plan year) otherwise the unused money would be forfeited by the employee. Routinely, as the end of the year approached, employees would stock up on contact lenses, eye glasses and the like so as to not lose their FSA dollars. Worse yet, many employees chose to forego participation because they were unsure of how much or whether they would actually incur medical expenses in the upcoming year. The IRS granted some relief to the use or lose rule in 2005 when it allowed a grace period of two months and fifteen (15) days, or until March 15th, for employees to use their FSA dollars from the previous year. This new modification allows for employees to save up to $500 of unused FSA contributions for the following year, while still making the maximum allowable contribution for that year into the plan. These modifications only apply to health FSA's and do not modify child care FSA's. The timing of the IRS modifications means many employers have to act fast to modify their plans if they so choose. Many employers will soon enter or are already in the open enrollment period for FSA election for 2014. Because employers can only offer either the carryover or maintain the grace period, they should carefully consider whether to change their plan. A review of plan usage, or an employee survey may aid employers in reaching this decision. Attention Illinois municipalities and counties. The Illinois Housing Development Authority (IHDA) is accepting applications for the Abandoned Properties Program (APP) that provides grants to municipalities and counties for the maintenance or demolition of abandoned residential properties within their jurisdiction. Grant funds may be used for securing, maintaining, demolishing, or rehabilitating abandoned homes. A list of specific activities allowed as part of securing and maintaining properties may be found at Abandoned Residential Property Municipality Relief Program Rules. The maximum grant award will be $75,000. Applications will be ranked according to criteria set forth in the application. The grant funds will be distributed throughout the state geographically as determined by statute. The highest ranking applications in each geographic set-aside will be awarded until funds are exhausted. The Meeting Number is　8884944032. The access code is 56589648403. Through your phone, dial 1-888-494-4032, and follow the telephonic prompts. We are pleased to report that the 2014 edition of the Illinois Municipal Handbook is now available for purchase from the Illinois Municipal League on its website. 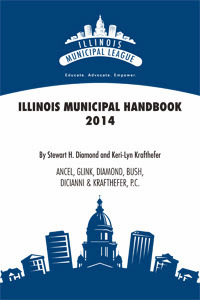 The Illinois Municipal Handbook is the must-have, go-to reference book for municipal officials and municipal attorneys. Ancel Glink attorney Stewart Diamond was the primary editor of the 2014 edition, which was produced by the Illinois Municipal League and authored and edited by Ancel Glink attorneys on a non-compensated basis. This edition provides valuable updates on the laws impacting municipalities and municipal officials. A summer camp operator alleged that the Town of Woodboro and Oneida County violated the camp's constitutional rights and RLUIPA in prohibiting the camp from running a year-round bible camp on residentially zoned property. The district court ruled in favor of the Town and County, and the camp operator appealed to the U.S. Court of Appeals for the Seventh Circuit. The Seventh Circuit affirmed, also ruling in favor of the Town and County in Eagle Cove Camp & Conference Center v. Town of Woodboro, (7th Cir. October 30, 2013). The Town had enacted a land use plan in 1998 that encouraged low density single family residential development along its lake and river-fronts. In 2009, the Town adopted a comprehensive plan that incorporated these goals. The zoning around Squash Lake reflects these goals, and all but seven of the properties in that area were zoned for single family uses. The seven non-residentially zoned lots were grandfathered with pre-existing uses. Eagle Cove (plaintiff) wanted to construct a bible camp on 34 acres of property they own on Squash Lake. Those parcels are all zoned for residential and/or residential and farming uses. Eagle Cove filed an application to rezone the property to a recreational zoning district to allow the bible camp. The County denied the rezone petition, and shortly thereafter Eagle Cove sought a conditional use permit to permit the bible camp while maintaining the residential zoning of the property. The Town recommended that the County deny the CUP because it was not consistent with the goals of the comprehensive plan, and the County agreed, denying the CUP. Shortly after the denial of the CUP, Eagle Cove filed suit, claiming violations of various constitutional and federal statutes, including RLUIPA, ADA, the Rehabilitation Act. The County and Town filed motion for summary judgment, which the district court granted. The Seventh Circuit first addressed Eagle Cove's "total exclusion claim" under RLUIPA, finding that the zoning decisions did not preclude Eagle Cove from conducting any religious assembly on the properties, just not in the form of a bible camp. Moreover, Eagle Cove could operate a bible camp in many other parts of the County, just not on this parcel. Second, the Court rejected Eagle Cove's substantial burden claim under RLUIPA, finding that there were numerous other locations within the County for Eagle Cove to place its bible camp. The comprehensive plan was a neutral land use regulation, and Eagle Cove does not get a "free pass" or special treatment on the basis of any religious purpose. Third, the fact that Eagle Cove spent considerable time and money on its various zoning applications does not constitute a substantial burden under RLUIPA. Eagle Cove's "equal terms" claim was also rejected, because the ban on year-round recreational camps applies equally to both religious and secular assemblies. Defendants sued an Illinois school district alleging the district violated their civil rights in engaging in activities relating to a failed referendum to increase the school district's property tax rate. Peraica v. Riverside-Brookfield H.S. Dist. 208, 2013 IL App (1st) 122351. Specifically, the defendants argued that the district engaged in illegal electioneering and that the referendum was misleading and understated the amount of the proposed tax increase. The circuit court dismissed plaintiff's case, and they appealed. On appeal, the appellate court first analyzed the standard for sufficiently alleging a section 1983 claim against a governmental entity, including a requirement that a plaintiff allege that the government (1) had an express policy that, when enforced, causes a constitutional deprivation; (2) had a widespread practice not authorized by law or express policy, but well settled so as to constitute custom or usage; or (3) the plaintiff's injury was caused by a person with final policymaking authority. The case contains a detailed analysis of the pleading standards for a 1983 case. The district argued that defendants' complaint failed to allege sufficient facts to support any one of these required allegations. Plaintiffs conceded that they were not claiming that there was a municipal policy at issue, and the court found that Plaintiffs failed to even attempt to show either widespread practice or that the injury was caused by a final policymaker. Moreover, the court held that plaintiffs failed to allege a violation of their rights under federal law since their complaint focused on violations of the state election code provisions relating to electioneering, and upheld the circuit court's dismissal.